Madison Beer’s first tattoo was of the word “Honey” on the inside of her lip. 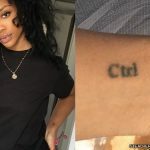 She got this tattoo back in March 2017 and has mentioned it a few times, but it was over a year before anyone actually saw it. 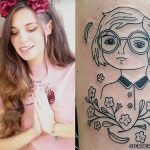 Fans finally got their first glimpse of secret tattoo in June 2018 when her “Home With You” music video was released. The video includes a brief closeup shot of Madison’s inner lip. Honey is the name of one of Madison’s pet dogs, who she declared as the “love of my life” in an instagram caption. She had another dog named Boo Boo first and chose Honey’s name as a reference to reality TV star Honey Boo Boo. 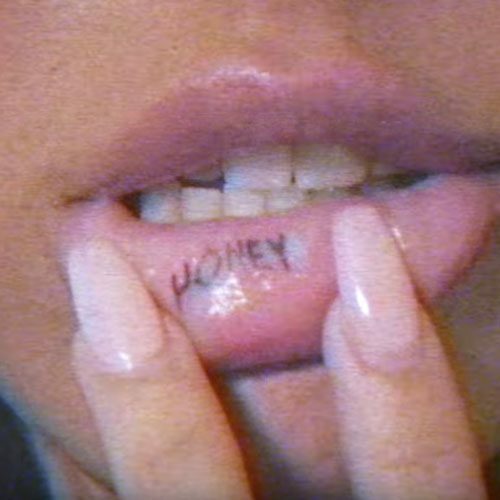 In March 2017 she accompanied Jack Johnson’s girlfriend Claudia Tihan as she got her own “honey” lip tattoo from the same artist Rafael Valdez. 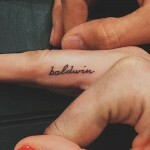 So it’s somewhat of a matching tattoo, but it seems like Madison had hers first. 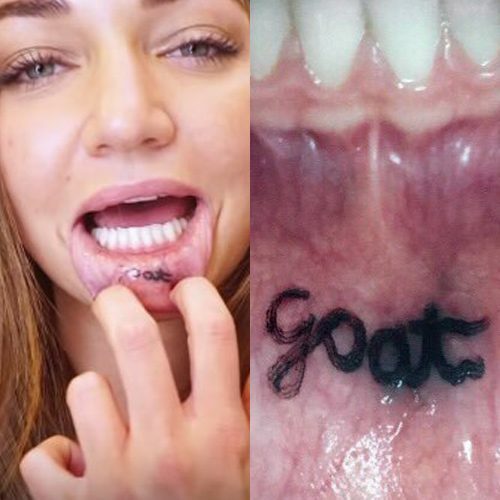 Erika Costell has the world “goat” inked inside her lower lip. 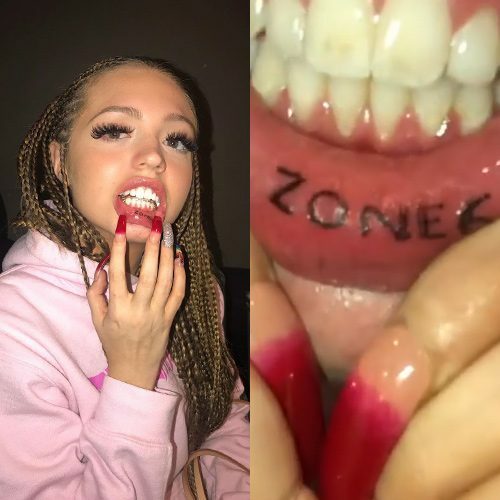 Woahhvicky has a tattoo inside her lower lip reading “ZONE 6” for the area of Atlanta that she claims to be from. 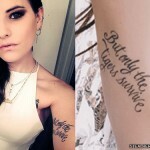 Alissa Violet has a tattoo inside her lip reading “BO$$”. 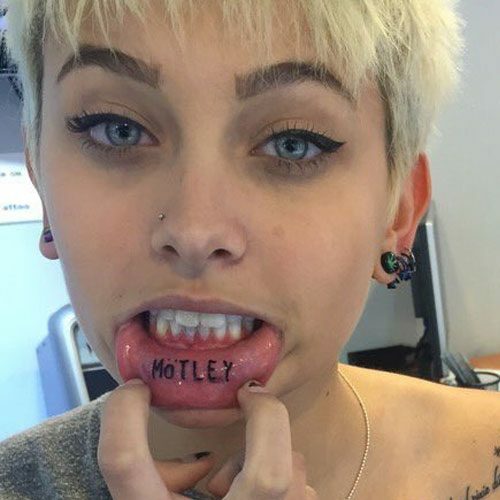 In April 2016, Paris Jackson got the word “MÖTLEY” tattooed on the inside of her lip for the classic metal band Mötley Crüe. 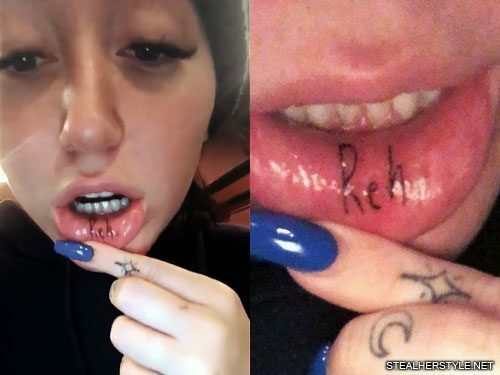 “Most lip tattoos are temporary and y’all have been my favorite since I was 12, so I figured why not,” she tweeted to Mötley Crüe drummer Tommy Lee. She later got a more permanent tribute to the band with their Dr Feelgood album logo on her bicep. 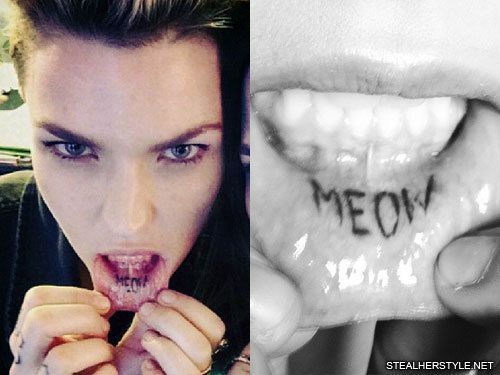 Kendall Jenner gets the word “meow” tattooed inside her lower lip by Jon Boy. It’s like saying “dang” or “darn.” I don’t like profanity so I try not to use it. “Daggum it” is the same thing as saying “Dang it.” It’s a rather southern term. Mindy got this tattoo during Warped Tour 2006 to remind her of home. Inspired by a friend with “sushi” tattooed in her lip, Mindy first considered getting “barbecue” as a tribute to her Tennessee home. She instead decided on “daggum” to remind her of her parents. We were on Warped tour and this guy was giving out free tattoos. I have a friend that has “sushi” with arrows pointing down her throat, and I wanted to get “barbecue.” Which is funny, I’m glad I didn’t because now I’m vegetarian. So I was thinking “what can I get that reminds me of home?” and my parents always say “daggum,” like “dang it,” “daggum it.” So I got that.